Every digital journey has a different beginning; a different reason or “pain” that prompts the search for a new hybrid pressroom addition. While variable data printing (VDP) and versioned graphics fit well into the realm of digital printing, many converters have shared the struggle of finding a technology that enables complex VDP at true production speeds. Imagine then throwing in the challenge of providing sequentially numbered pressure sensitive labels, versioned (color and image) graphics with 23 spot colors, multiple barcodes and varied lot sizes (typically, 10,000 - 20,000 per job). Is your head spinning yet? 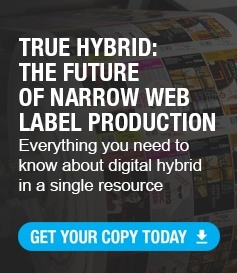 For one label and packaging converter, this dilemma was the foundation that led them down the path to find the most profitable and flexible hybrid powerhouse. Mark Andy Digital Series proved to be the perfect match for WS Packaging’s VDP, versioned graphics and prime label needs, running at speeds of 240 fpm (73 mpm). The digital label press is loaded to run production for two 12-hour shifts daily, seven days per week. The company’s Digital Series runs anywhere from 350 to 8,000 feet per job, and can tackle at least 50 changeovers in a shift. Recently, the production-level press has been loaded with more traditional prime label work. For this type of work, the digital hybrid press runs nearly 50 jobs a day, with run lengths averaging 1,600 linear feet per SKU. Formerly produced on a flexographic press, the equivalent three shifts of flexo work are now routinely completed in the single shift with Mark Andy Digital Series. So what does this truly mean for their business and their bottom line? Take a closer look at their experience and the true benefits our partners at WS have witnessed. Mark Andy Digital Series leverages the advantages of digital with the proven capabilities of flexo printing to provide the most profitable total production solution. Megean Speak, Marketing Specialist at Mark Andy, is a solutions-oriented marketer, strategic planner, and data enthusiast. With a personal interest in creative design, she has a new found love for label and packaging design. You can also find Megean on LinkedIn.